Join ASWIFTT RADIO Host Brenda Johnson Padgitt on August 24, 2013 at 1 pm CST, 2 pm EST and 11 am PST as she interviews author Kenneth Simmons. 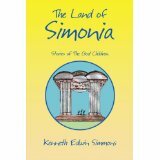 Simmons has written the book “The Land of Simonia” and is currently working on releasing a second edition of his book. ASWIFTT PUBLISHING, LLC will release the second edition of “The Land of Simonia” in the fall of 2013. Simmons will discuss the story line of his book, the characters and his future plans as an author. Kenneth is from Greenwood, Mississippi. He became a writer at the age of 19. In 2001, Kenneth says he gave his life to God and at that moment something was placed inside of him. He wrote his first book of gospel poetry and another collection of stories. His goal is to give the world something fresh and new to see and read. He hopes his writings leave you wanting more and more of Simonia. Don’t forget to tune in online to listen to the show at: http://www.blogtalkradio.com/aswifttradio. For more information on the show contact ASWIFTT RADIO Host Brenda Johnson Padgitt at 1-800-775-2708 ext. 3060 or e-mail: news@aswifttradio.net.